Windermere is a small Cumbrian town lying around ½ mile inland from the lake of the same name. Before the middle of the 19th century it was just a small, insignificant village called Birthwaite. Its fortunes changed dramatically in the 1840s when the decision was made to extend the rail network to the Lake District and open the area to the workers from the rapidly expanding towns and cities of North West England. The plans met some resistance, most notably from William Wordsworth, but in 1845 the Kendal and Windermere Railway Act received royal ascent. The original plans were to build the railway to the shores of the lake at Bowness. However because of the challenges presented by the steep decline to the waterfront it was decided to terminate the line at Birthwaite. The village was subsequently renamed Windermere to emphasise the connection with the lake and grew rapidly as the tourists flocked to the area. Development over the years has seen Windermere and Bowness join together, though the two towns still have distinguishable centres. Today the town of Windermere is very much a transport hub and gateway to the Lake District, with most of the tourist attractions located in and around Bowness. It does however offer a large number of guest houses and bed and breakfast properties. Most of the hotels and guest houses in Windermere don’t boast views of the lake but rates are considerably cheaper rates than those charged by hotels in Bowness. 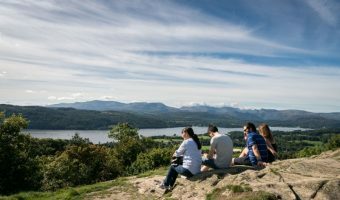 There are no major tourist attractions in Windermere itself, but Bowness can be reached on foot in less than 30 minutes. Attractions in Bowness include the World of Beatrix Potter, Old Laundry Theatre, and the Windermere Steamboat Museum (currently closed for renovations). Windermere Lake Cruises also have a base in Bowness and offer boat trips to Lakeside (for the Lakes Aquarium, Lakeside and Haverthwaite Railway, and Fell Foot Park) and Ambleside (Waterhead). Blackwell and the Lake District Visitor Centre at Brockhole are just a short drive from Windermere. 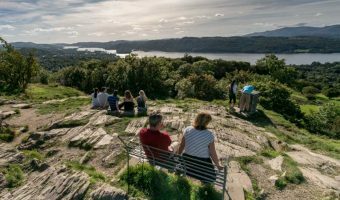 The most popular walk from Windermere is the short stroll up to Orrest Head. At 784 feet above sea level the peak is famous for its panoramic views of Windermere, Scafell Pike, Langdale Pikes, the Old Man of Coniston, and Morecambe Bay. Climb to the viewpoint at the top and follow the footsteps of well-known walker and author Alfred Wainwright. In 1930, aged just 23, Wainwright arrived in Windermere and climbed this hill for his first view of the Lake District fells. The route starts just west of the Windermere Hotel, opposite Windermere Train Station, and is well signposted. The climb to the top is easy and takes most people less than 30 minutes. The Windermere Tourist Information Centre is situated at the top of Victoria Street in the town centre, close to the train station and Booths supermarket. Windermere is easily reached from the M6 motorway. Visitors travelling from the north should exit the M6 at Junction 40 (near Penrith) and follow the A592 for around 25 miles. Those coming from the south should leave the M6 at Junction 36 and take the A590 and A591. South Lakeland District Council operates a car park on Broad Street in Windermere town centre (LA23 2AB). It offers around 100 car parking spaces with short and long-stay options. 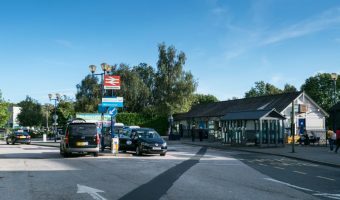 Windermere Train Station is located on Station Precinct in the centre of town. Facilities include a small car park and taxi rank. A former railway building next to the station now houses a Booths supermarket. First TransPennine Express runs trains from here to Oxenholme train station, calling at Staveley, Burneside, and Kendal stations. Trains from Oxenholme include Virgin Trains services from Scotland to London and Birmingham and First TransPennine Express services between Scotland and Manchester Airport. First TransPennine Express also operates direct trains from Manchester Airport to Windermere. Stops include Manchester Piccadilly, Manchester Oxford Road, Bolton, Preston, Lancaster, Oxenholme, Kendal, Burneside, and Staveley. The daily National Express coach service from Cumbria to London stops outside Windermere train station. On the way it also calls at Grasmere, Windermere, Barrow, Carnforth, Morecambe, Lancaster, Preston, Wigan, and Birmingham. One of the most popular walks in the Lake District. Train station serving Windermere. View information and train times.